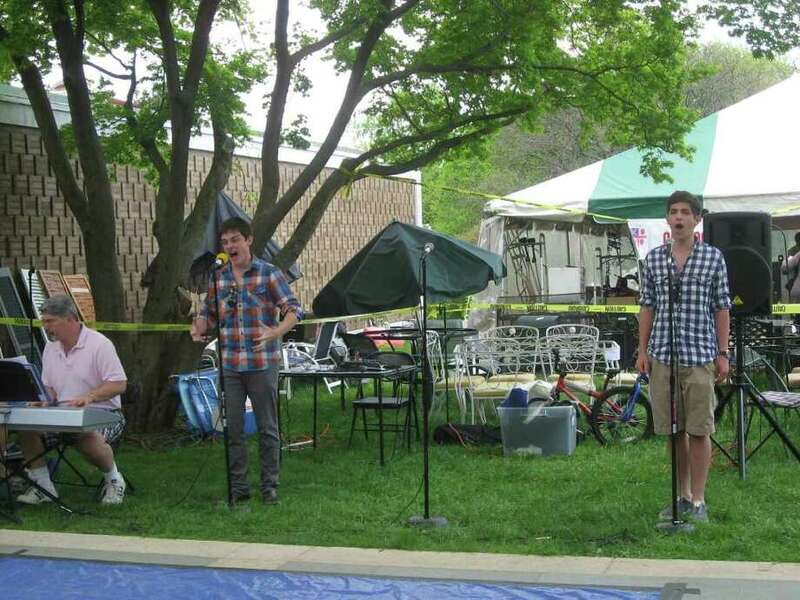 New Canaan High School to debut "The Secret Garden"
Nick Zanca (left) and Ryan Stiffelman sing a duet from "The Secret Garden" teaser at the recent May Fair. New Canaan High School drama students are nearly ready with their final play for this year. The spring musical is "The Secret Garden" a musical adaption of Frances Hodgson Burnett's classic story by Marsha Norman and Lucy Simon. This show is rarely done by high schools, since the score is one of the most challenging around. But this year's crop of vocalists are up to the challenge. Anyone who caught the teaser at the May Fair was blown away by the talent of seniors Nick Zanca and Ryan Stiffelman in a powerful duet, or the strong vocals of Keri DeTullio, who will play the show's main character, Mary Lennox. Along with Anne Achenbaum (Lili) and Rebecca Mellinger (Colin Craven), the show may be very moving. As the opening night approaches, the shows cast and crew are to meet with more obstacles than just the difficulties of the score. The production will also have to work around the schedule of the much-used high school auditorium. The show will run for three nights, but during two of the days the entire set must be removed and later reset in order allow other activities scheduled during the day. But New Canaan High School drama students are true troopers. The show which runs June 2, 3, and 4 at 7:30 p.m. will continue to show off the amazing abilities of the NCHS thespians. Tickets will be on sale in the high school lobby Monday though Friday from 11 a.m. to 2:30 p.m., and up to one hour before show times. Sponsors for the show include Garden Catering, New Canaan Cleaners, New Canaan Veterinary Hospital, The Studio, New England Academy of Dance, HTG Investment Advisors, Performing Arts Conservatory of New Canaan and Karl Chevrolet.